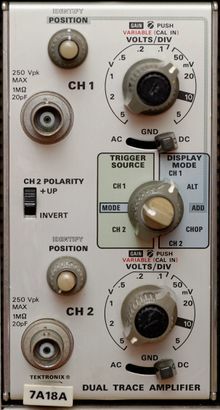 The Tektronix 7A18 is a general-purpose 75 MHz dual-trace vertical plug-in for 7000-series scopes. Model 7A18N is identical except it omits the readout circuits. Option 06 (first offered in 1975 catalog) adds offset voltage controls giving ±200 Div offset range. This option replaces the IDENTIFY buttons with DC offset controls and adds a fourth "DC offset" position to the input coupling switch. The 200 MHz 7A26 and 400 MHz 7A24 share the same front panel layout and operation. Mode: CH1 only, CH2 only, Add CH1+CH2, Alternating, Chopped. CH2 can be inverted. 7A18A left side. The step attenuators can be seen on the left, the amplifier board on the right. 7A18A right side. The circuit boards on top carry the readout circuitry. 7A18 attenuator opened. One of the attenuation R/C modules has been unplugged to reveal the switch contacts. 7A18A Opt.06 Front. AC/GND/DC switches have an extra rightmost "DC Offset" position enabling the offset controls. 7A18A Opt.06 left side (rear). Note the two blue 10T-potentiometers for offset voltage adjustment. 7A18A Opt.06 - offset controls take the place of the Identify buttons on the standard model.